A new Hertfordshire neighbourhood has come together to celebrate the festive season with a fundraising carol concert around a Christmas tree donated to the community by a local home builder. The residents at Bovis Homes' Aspen Park location in Apsley got together to sing carols with the Hemel Hempsted Brass Band, with children decorating the brightly lit Christmas tree with their own bauble creations. Some of the proceeds from the event are being given to local homeless charity DENS, with the rest going towards future community events. Cathy Chivers from the local resident's association MEAPRA which organises the event, said: "We are very grateful to Bovis Homes for donating the tree, along with its lights and baubles, to the gateway between the Aspen and Manor estates - and it is the focal point of our fundraising and carol service." "The annual Christmas event is a lovely time of year for the Aspen Park community and nearby Manor Park residents, and it's a fantastic event to support," added regional marketing manager, Deborah Rigger. "A real sense of community has flourished here and we're very proud to be a part of it." 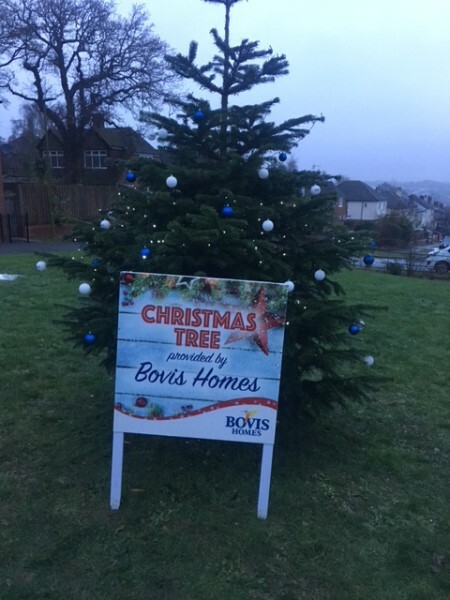 Bovis Homes has proudly provided Aspen Park with a Christmas tree for the Carols on the Green event located on Shearwater Road in previous years, and this year's 10-foot Norway Fir has again created a magical hub for the occasion. "We're delighted to bring further much-needed homes to Apsley," says Deborah. "We've already had a lot of interest in the new homes, which are available in a variety of styles and layouts to suit all buyers."